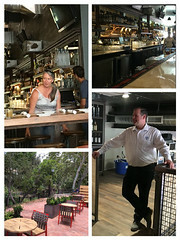 A few months ago I wrote a blog about the moving and complete revamp of the SLO Brew, a staple hot spot of San Luis Obispo‘s nightlife. Well stage 1 is now complete and it’s fantastic! The entire vibe and atmosphere of the restaurant is updated. Instead of mediocre bar burgers, nachos and hot dogs the food is now way more gastropub with the burgers being upgraded using grass-fed sustainable beef, and those nachos are now dueling-pork and duck with home-style tortilla chips. 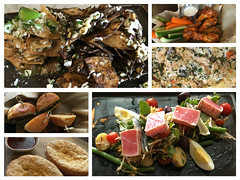 It’s a much fresher, more mature and delicious dining experience but still paired with the hip, chill musical vibe the Brew has been known for. 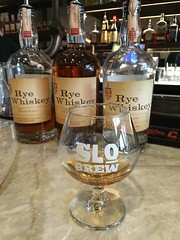 They’ve even updated their bar with handcrafted cocktails and a barrel aged spirits and beer program; with a brewery on premises. The Brew has a direct fired copper brew kettle, one of only 2 in California, because the copper allows for conduction of a more even direct heat, the result is more caramelization in the finished product. The brewery at the Brew is a small system (the bigger one is out at the “Rock”) but even here they are still able to expand ideas and be creative while breaking out of the “rut”, that happens when you’ve been doing the same thing for 30+ years, and be more experimental. Because the brewing capacity at the Higuera location is about 1400 cases they aren’t selling direct to go, however the “Rock” location has capacity for 10,000 so when it’s fully open you will be able to go buy direct. Essentially getting your beer right off the canning line, which they will have up and running at full distribution capacity by 8/1/16. As a community give back, sales of cans of the “original” brand, they will be donating proceeds of the sales to the TA (Tom Adamski) Foundation. 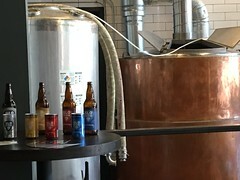 The brewery area is located at the front of SLO Brew, with walls opening to the street allowing the Brewers to interface and be very engaged with the public during the day. The new set up allows the fresh made beer to go directly from tanks to the taps behind the bar. Currently they have 14 taps running but have 28 total, so as to be collaborative with other brewers and breweries. The Rock will have a much larger production, while still providing a fully handcrafted experience. Additionally in the coming months they will be teaching some beer centric classes. Continuing with the hand crafted concept, their cocktails are personal recipes, and made with hand squeezed juices using spirits out of the barrel aged and distilling programs. They also offer pitchers of specialty punches and margaritas. Re-fined is the fermenter and distiller of the mash for the whiskey. Presently they have 3 different oak barrel sizes; 5, and 10 gallon barrels in which they age for 10 months and 15 that they age in for 12-14 months-as a result the releases are cyclical. Eventually they will be expanding the spirits program to include a more diverse selection. The key to great cocktails is hand crafting and that is exactly what the Brew aims to do. Their new chef, Tom Fundaro previously of Villa Creek Restaurant, is adamant that the food is friendly and a great compliment to the beer. His theory is, “food is beer and good times”. He makes sure all produce is 100% organic and gets it from Veritable Vegetable Distribution to ensure quality and consistency. His cooking is the best of both worlds-old school pub food meets contemporary quality. He is turning the Brew’s food from a basic 2nd thought bar menu, into more of a higher end gastropub, while pushing the envelope and making really good sustainably sourced “beer food”. As I mentioned earlier the burgers are from 100% grass-fed cattle and their steak is Wagyu beef. Chef’s favorites from the menu include “The Nasty Nashville Hot Thighs”, the pizzas, of course the dueling (duck v. pork) nachos and the Hatch green chili. His goal is to pair the food to the beer. Another feature of the new Brew’s restaurant is they have created extra-large tables to encourage communal dining and meeting new people. The idea being It’s all about the connection-feed the table not the individual for a more well-rounded experience, as opposed to solo or just couple dining. Add to that their commitment to service in bringing all the components together. The Brew is still adamant about sticking to its musical roots, so bands and acts will still perform inside but butted up to the patio. There is a Mezzanine level for VIPs, private events or for a slightly higher priced general admission that will have its own whiskey bar. For more VIP events, they can turn it into a Sky-box type lounge with couches and chairs, private cocktail service and a temporary beer bar. It also houses the DJ and sound booth. While they are very much about keeping the original feel of the location being that the Carissa Building is a historical space; they are working hard to show off it’s best features including a roof top deck accessible only through the Lofts and the specific room it’s connected to. They’ve built the Lofts out to be 5 units with two three-bedroom, two two-bedroom and one studio, with the additional pull out couches they can comfortably house 32 guests. With all the up and coming craft breweries in the area, creating a Beer-cation destination starting at the SLO Brew and the Lofts is beyond feasible, and they are really stepping up to the challenge by getting out of the mass market and having their brewers focusing much more on the craft beer scene. Can I get you a CAB?